The Architect Title Act came into effect on 1 October 1988. An office was established to administer the register in the same year: the ‘Stichting Bureau Architectenregister’ (SBA, or the Dutch Architecture Registration Board). The title protection associated with registration came into force five years later. Since then, only those who are registered in the Architects Register are entitled to use the title of architect, town planner, garden and landscape architect or interior architect. Entry in the register has been restricted thus far to those possessing the diploma in the relevant field as specified in the Act, from a university or higher professional education institution, if one had completed the so-called architects’ examination successfully, or if one was in possession of a foreign diploma. Until now professional experience or annual refresher or supplementary training have not been requirements for inclusion in the register. 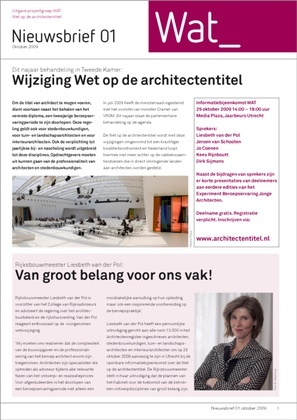 For Projectgroep WAT, Visualspace designs the identity, the website, and a print- and digital version of the newsletter.